Been reading about the cheap prices of medical drugs available in Canada so I asked my licensed and degreed pill pushing friend from Georgia what he thought of it; hes a straight shooter with me and holds no punches. Basically he thinks it is a good thing for the consumer as he is one also. Said you can ask any pharmacist and they will tell you that the US drug companies gouge the US public. He said the cost of name brand drugs increase 8 to 12% yearly while inflation is 2  4%; go figure. Additionally he said, the cost of an average of $8B to bring one drug to market while it appears the drug companies are trying to recoup all their expenses from the US while only nominally charging other countries. He also mentioned the mucho much cheaper prices of Mexican drugs and no prescription is needed for most of them. HOWEVER there are almost no controls so you may buy out of date or contaminated drugs. In Canada the controls are much better than Mexico (but not as good as in the USA) so safety is not as big a concern. I went to school with this Georgia boy and had no idea he could spell so many big words. Anyway buyers beware and Ill be the first one to say I told you so. Did another first for me this morning by making or putting up pickled tomatoes. After reading numerous ways to put them up, I ended up doing it my way anyway. Never bought or used cider vinegar before and boy howdy does that stuff stink when heated. I used very little cider vinegar in the pickled tomato produce and added some olive oil with whole Pearl onions and sliced Vidalia onions along with some cubed red bell pepper. Started out with intentions of making one pint and ended up with a quart full by adding a little of this and a little of that. Did not want to make a lot because if it aint good, itll go to waste. Ill let it sit in the cupboard until about November then break it open and sample it out with some speckled butter beans, boiled okra, cream corn, dead chicken and cornbread. Some of the recipes I read would take up to four days to finish making pickled tomatoes but I aint got time to mess with all that; so hope I didnt mess this one up too bad. Also put up a pint of pepper sauce with the cider vinegar and one pint with white vinegar. Managed to scrounge up a few green tomatoes and had enough for a small batch of chowchow. This has got to be the mildest batch ever made by me. Would you believe I only used three pods of cayenne pepper? I have made some with 751 pods and that was so hot I could not eat it. Even the Mrs. complained about that batch being so hot. My green tomato crop has all but dried up now but with this little mess, itll make do for now. This hot weather sure makes the hot pepper produce as I have plenty and some is hotter than a firecracker too. HUFFMAN  Three men set out to fish from Lake Houston Marina at about 9:20 p.m. on June 22, only one would survive the brief, tragic misadventure. Witnesses say the trio scurried out into twilight with fishing equipment and fresh minnows but they were calling for help shortly thereafter. Although the Houston Lake Patrol responded when informed of the calls for help, critical time would pass before the boat was found. Lack of boating safety seemed to be a factor. 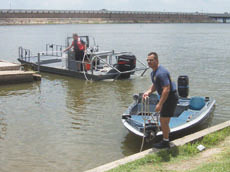 The Houston Lake Patrol found the boat and marked it with a buoy shortly after 10:00 p.m. but it did not have the bottom drain plug in place. There were no life jackets aboard. Family members informed Houston Police that it was the second time the brothers had used the boat. Houston Lake Patrol determined that the boat must have been swamped with water when the front end came down as it came to rest and then it capsized. Houston Police Dive Teams found the body of Yonari Olazaran, 28, at about 4:10 a.m., Monday, June 23. They called off the search for Rojello Olazaran, 26, at about 1:00 p.m.
Houston Lake Patrol estimates the sole survivor swam at least 200 yards against the wind from a location northwest of the McKay Bridge. 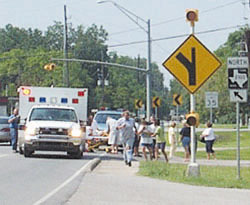 The survivor reached a private dock in Huffman and telephoned for help. 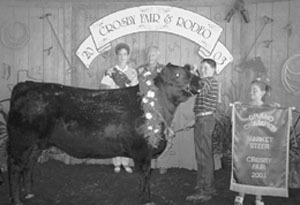 CROSBY  The Crosby Fair & Rodeo Board awarded seven new scholarships, sold the Grand Champion Steer at an all-time record and had good attendance to the rodeo sport and concert shows in spite of rain and rumors. Five scholarships were awarded during the auction and two were awarded to graduate students during the rodeo. Casey Rush, Kathryn Morrison, Kurt Marek, Kaylee Chitty and Tiffaney Bradley received scholarships during the auction. Kimberly Clifton and Jeanelle Windham were awarded scholarships inside the Rock’n C Arena on Saturday night. The auction total was $164,810 for 96 exhibits. 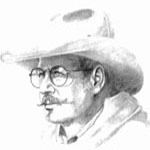 Wade Armstrong exhibited the 1300 lbs., Grand Champion Steer bought by Mr. Owens of Owens Specialty Company for $11,000. Annie Michalsky bought the 57th Crosby Fair & Rodeo Belt Buckle for $2,000. RSMIS Foundation purchased a round trip to Las Vegas for $3,050. This year, the Crosby Rodeo Queens Contest attracted five lovely and skilled equestrians. Misty Watkins was crowned Queen. Kathryn Morrison was Duchess. Most photogenic went to Andrea Deajon. Horsemanship also went to Misty Watkins. Nicole McGinty was Miss Congeniality. McGinty paid the cost of taking her award, on Thursday night she sprained her ankle following a hard ride. The spunky rider didn’t let that stop her though, not only did she perform well the next two nights, she delighted everyone with her presence. Also recognized for her participation was Julie Glover. BAYTOWN  Lakewood Heights residents awoke in the wee hours of Saturday morning to a mammoth police presence beginning at about 3:26 a.m.
At about 3:18 a.m. on June 14, a Baytown 911 Operator received a call from a man claiming to be at 304 Lakewood. The man on the phone was reportedly calm. The man then stated,  I shot my wife and my child. but hung up the phone before giving his name. William Michael Chamblin, 49, was taken into custody at about 6:35 a.m. Without warning the man walked out of his front door and complied with police instructions. So ended over three hours of stand-off with Baytown SWAT teams. Once inside, mother and daughter were lying side by side in the kitchen, both had gunshot wounds to the head and chest. Two family pets, dogs, also lay dead in the kitchen. Chamblin was arraigned on June 16 in the 262nd District Court. Judge Mike Anderson placed Chamblin on No Bond and he remains in Harris County Jail as of press time. Baytown Police Sgt. Richard Whitaker indicates that police suspect Chamblin shot his family sometime between 7:30 and midnight Friday. Whitaker indicates his office is speaking with friends and family to determine why the crime was committed. We have never had a case more clear cut about how a murder was committed but we are still working on the why. Whitaker ventured concerning the gruesome details that resulted in the charge of capital murder. It looks like he took them by surprise. said Whitaker.